People who want to work as a medical assistant in Connecticut should be able to look forward to a bright job outlook. Employment of medical assistants is expected to grow by 27.4 percent from 2012 to 2022, adding 340 new jobs each year, according to Projections Central. Work for medical assistants can be found in all corners of the healthcare system, from offices of physicians to hospitals to outpatient care clinics. Regardless of where they work, medical assistants are usually the first in line to interact with patients. From checking patients in at the front office to vital sign assessment in the back office, medical assistants form the backbone of a hard-working facility. Discover what medical assistants in Connecticut can expect from their chosen field including salaries and certification requirements. When you earn a degree in medical assisting, you open the door wide for career growth opportunities. Aside from working with patients, you are also trained to perform administrative tasks for physicians and health care facilities. We've analyzed schools across the state based on factors such as net price, institutional financial aid and availability of various student services. 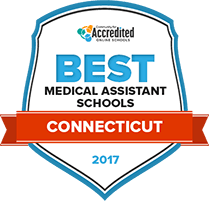 To find the right program for your needs, we've compiled our 2017 list of the Top Schools in Connecticut for Medical Assisting. See who made the list below. In the span of twelve months, students can complete an undergraduate certificate in medical and clinical assisting with Capital Community College. This program is designed to properly prepare students for entry level positions as a medical assistant in a hospital, health clinic, or medical office. Capital CC is proud to offer its programs at a low tuition rate, allowing students to advance their knowledge and their careers without too much of a financial setback. Capital CC is conscious of the disabilities that may hamper a student’s success, which is why they provide a variety of disability resources to guarantee student success. An associate of science in medical assisting earned at Quinebaug Valley Community College can lead students into a successful career as a medical assistant, or may lead students into a four-year bachelor’s program to continue their education. This program is designed to develop a well-rounded understanding of procedures common to medical offices and clinics, including scheduling patient appointments, providing assistance with both basic and complex medical procedures, and processing payment for treatment. Personal counselors, academic advisors, and individual tutors are available to all QVCC students, allowing them to stay on top of their academics and graduate on time. Over the last five years, Northwestern Connecticut Community College has produced graduates from their medical assisting program with a 100 percent satisfaction rate. Students with a passion for working with patients, but are more interested in administrative work, may find their niche in this program, as they will progress through a curriculum revolving around medical terminology, medical ethics, and medical terminology. NWCC regularly holds on-campus events that allow students to build social bonds with their peers. Distance learning opportunities are also available to NWCC students who may feel traditional on-campus classes will disrupt their daily schedule. Whether seeking a certificate program or associate degree, the proper training is necessary to become certified. This search tool can help students narrow down the options based on the school program, their particular interests and their budget. How does Connecticut define "medical assistant"? In Connecticut, medical assistants are considered unlicensed personnel who can provide certain medical care for patients, with the understanding that advanced medical knowledge is not necessary to complete the tasks that have been delegated to them. The state government has clearly listed what services might be delegated to unlicensed personnel, including certified medical assistants. Though Connecticut law does not define the scope of practice for medical assistants, nor does it require certification in order to begin work, most employers in the state consider certification a basic entry-level requirement. The most common certification is the Certified Medical Assistant (CMA). The state keeps track of residents who are registered with the American Association of Medical Assistants. Those who graduate from an accredited institution are eligible to sit for a certification exam. Though there are numerous certifications possible, the state formally recognizes those who become a certified medical assistant (CMA) and are registered with the American Association of Medical Assistants. Is formal education or training required? Though there is no scope of practice listed in Connecticut law for medical assistants, many employers require their medical assistants to obtain certification in order to work for them. In order to become certified, students must graduate from a training program or formal education program. Those who become certified as medical assistants and work in such capacity in Connecticut will be included on a list of CMA-certified medical assistants employed in the state. This list is updated annually, and is offered for public viewing through the state government website. Are there tasks outside the scope of medical assistants in Connecticut? Those who work as medical assistants in Connecticut can look forward to median salaries higher than the national wage for medical assistants. According to the Bureau of Labor Statistics (BLS), Connecticut was the fifth-highest paying state for medical assistants in 2014. Here is a comparison of wages on the state and national level. Salaries are also dependent upon geographical location. The following chart denotes what medical assistants in various metropolitan areas of Connecticut make in comparison to others in the state. Connecticut is expected to employ another 2,010 medical assistants between 2012 and 2022, which makes the growth rate just a bit less than the national average for the profession. The below table provides further details. There are approximately 10 medical assisting schools in Connecticut accredited by the Commission on Accreditation of Allied Health Education Programs (CAAHEP), and there are approximately eight programs or schools accredited by the Accrediting Bureau of Health Education Schools (ABHES). The following spotlight school could be worth exploring for those interested in medical assistant opportunities in Connecticut. Capital Community College offers a wide variety of educational opportunities, including associate degrees, certificates, continuing education and stand-alone courses. Offers a certificate program that can be completed in one year; also offers an associate degree program, which takes two years to complete. CPR and first aid certification is a prerequisite for either program. The home of the Certified Medical Assistant (CMA) credential, recognized by Connecticut and required by many employers in the state. This informative page breaks down what the state requires of medical assistants, as well as provides links to other areas that might be of interest to those in the profession. The CSMA is very active in state legislation concerning healthcare and medical assisting. Also offers a job board, information on continuing education and more.